The recently-published Dun & Bradstreet Global Risk Indicator (GRI) has ranked Singapore as the third safest country in Asia Pacific for investors, after Australia and Hong Kong. The report, which assessed the political, commercial, economic and external risks of doing business in 131 countries, also ranked the Lion City ahead of Asian economic powerhouses China and Japan. Analysis by Singapore company registration specialist Rikvin shows that the latest survey by Dun & Bradstreet builds on the Republic’s list of investment-related accolades. In the 2011 BERI Report, Singapore has been named the city with the world’s best investment potential and prior to that, the Republic was The Globalization Index’s top third economy in foreign trade and investment in 2010. “The latest ranking by Dun & Bradstreet build on Singapore’s track record as one of the most attractive environments for business investments due to its stable risk profile. Factors such as political stability, pro-business policies, sophisticated infrastructure and attractive tax system all contribute to its reputation as an esteemed investment location in Asia Pacific,” said Mr. Satish Bakhda, General Manager and Head of Rikvin’s Operations. Further analysis by Rikvin shows that Facebook co-founder Eduardo Saverin’s recent choice to be based in Singapore is another strong indicator of the Republic’s ability to woo entrepreneurs and high net worth investors. Rikvin is also confident that investors and entrepreneurs who wish to ride the wave of Asia’s long term growth story will follow suit due to the following factors. Singapore has a progressive tax system that is designed to spur entrepreneurship and business activity. 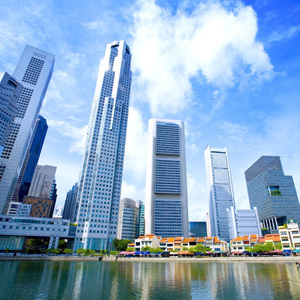 Singapore corporate tax and personal tax system start at 0% and do not exceed 20%. Furthermore in order to incentivize investors, capital gains are not taxed in the Republic. In addition, Singapore offers every business that opts for Singapore company formation an automatic 400% tax deduction or option for a 60% cash payout each year for investments made via the Productivity and Innovation Credit (PIC) scheme. “More importantly, under the PIC scheme, the government incentivizes entrepreneurs to acquire and register Intellectual Property Rights (IPRs). This is bolstered by the Republic’s strong focus on intellectual property protection, which is crucial in today’s competitive global business environment. All these business-enabling factors give Singapore a defining edge in encouraging entrepreneurship and generating confidence in investors to consider Singapore company formation,” added Mr. Bakhda. Other than attractive tax rates and incentives, the Republic incentivizes foreign investments and company setup by offering an extensive network of Free Trade Agreements (20 FTAs with 27 economies) and Avoidance of Double Tax Agreements (69 DTAs). “These agreements not only facilitate cross-border trade; they also safeguard the interests of Singapore’s investors and ensure that those who invest in Singapore will be able to reap maximum returns,” affirmed Mr. Bakhda.